A Jetpack Contact Form can be added from within a page or post by clicking the Add Form button that appears next to the Add Media button, above the Visual Editor. Use Jetpack’s Add Contact Form button above the Visual Editor to get started. One of the most popular contact form plugins, Contact Form 7 is still maintained and updated. It’s popularity also means that there are several supporting plugins that can be installed to expand its capabilities. With Contact Form 7 installed, navigate to Contact in your main WordPress left menu. There you can click Add New to create a new form. Forms can be added to pages or posts using the shortcode provided on the Contact form overview page. With Contact Form 7 installed, navigate to Contact in your main WordPress left menu. Gravity Forms is a premium plugin. If you’d like a drag and drop form builder that’s highly customizable, it’s the form builder we recommend. Navigate to Forms in your main WordPress left menu to create your first form. Forms can then be inserted into pages or posts via the Add Form button that appears next to Add Media, above the Visual Editor. Gravity Forms also has a widget which can be used to insert forms into widget ready areas. 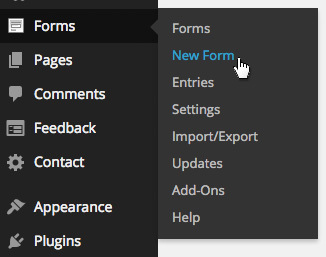 Navigate to Forms in your main WordPress left menu to create your first form.